Ride to the Clyde and meet with Clyde Valley H.O.G. members every Wednesday night from 7.30pm, at The Harvester, Springfield Quay, Glasgow (G5 8NP). 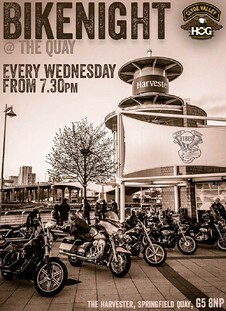 Please come along and meet like minded Harley enthusiasts and talk bikes and life! During the summer months, there can be as many as 30 - 40 bikes there of a night. Everyone is welcome to attend to get a feel for what Clyde Valley Chapter is all about. Always a great night with good craic!